Azolium (imidazolium and benzimidazolium) salts are known as stable precursors for the synthesis of Metal-N-Heterocyclic Carbene (M-NHC) complexes. Recently, some reports have been compiled indicating that benzimidazolium salts have anticarcinogenic properties. The current research is the further investigation of this phenomenon. Three ortho-xylene linked bis-benzimidazolium salts (1-3) with octyl, nonyl and decyl terminal chain lengths have been synthesized. Each of the compounds was characterized using FT-IR and NMR spectroscopic techniques. The molecular geometries of two of the salts (1-2) have been established using X-ray crystallographic technique. The compounds were tested for their cytotoxic properties against three cancerous cell lines namely, human colon cancer (HCT 116), human colorectal adenocarcinoma (HT- 29) and human breast adenocarcinoma (MCF-7). Mouse embryonic fibroblast (3T3-L1) was used as the model cell line of normal cells. 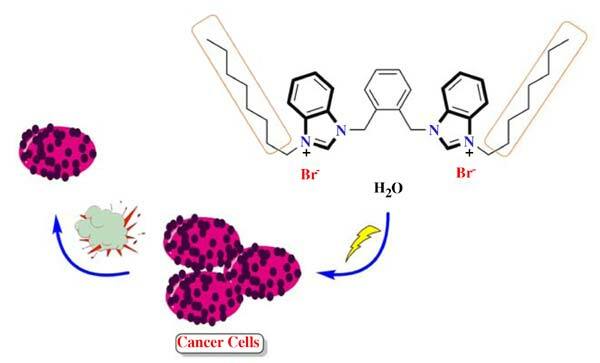 The compounds showed selective anti-proliferative activities against the colorectal carcinoma cells. For HCT 116 and HT-29 cells, the IC50 values ranged 0.9-2.6 µM and 4.0-10.0 µM, respectively. The salts 1 and 3 displayed moderate cytotoxicity against the breast cancer (MCF-7) cells with IC50 58.2 and 13.3 µM, respectively. However, the salt 2 produced strong cytotoxicity against MCF-7 cells with IC50 4.4 µM. Interestingly, the compounds demonstrated poor cytotoxic effects towards the normal cells (3T3-L1) as the IC50 was found to be as high as 48.0 µM. Salts 2 and 3 demonstrated more pronounced anti-proliferative effect than the standard drugs used (5-Flourouracil and Tamoxifen). Benzimidazole, benzimidazolium salts, HCT116, MCF-7, HT-29. School of Chemical Sciences, Universiti Sains Malaysia, 11800 USM Penang, Malaysia.